Creativity is rather mysterious. What is creativity? How are people creative? Are some ideas more creative than others? I thought I’d share some of the concepts that have helped my understanding of creativity. Hopefully they’ll be of use to you too. Creativity can take many different forms. For Boden creative ideas could be ‘concepts, poems, musical compositions, scientific theories, cooking recipes, choreography, jokes … and so on’ and creative artifacts could include ‘paintings, sculpture, steam-engines, vacuum cleaners, pottery, origami, penny-whistles … and many more.’ It’s great to be reminded how creativity is important to so many areas of life. 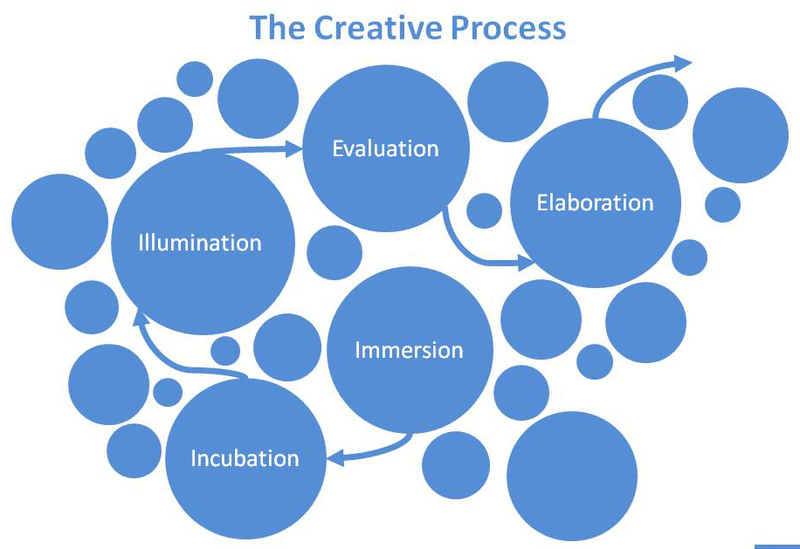 Creative individuals often follow a creative process similar to this: Creative individuals go through a period of deep engagement with their subject matter. They spend time absorbing, reflecting and contextualising the subject before the creative insight strikes them. Then they develop their creative insight into a tangible idea or artifact. Finally they evaluate its relevance. They think about it and reflect on it’s importance themselves. They share it with other people and getting their opinions on the idea or artifact to see if other people find it new, surprising and valuable. Each of the steps, or the whole process, can be accomplished very quickly or may take a long time. Creativity isn’t some magical or mystical ability. It relies on traits that we all have: thinking, perception, memory, and ability to reflect on what we have done and compare it to what other people have created. Creativity isn’t limited to a few special people it is something that everyone can do. We are all creative to different degrees, although some of our ideas and artefacts are more creative than others. Are some ideas more creative than others? Well, yes, some ideas are more creative than others. It depends on the individual creator and the context in which they are creating. Boden and Gero say there are three different types of creativity. P-Creativity: Personal or psychological creativity is when someone creates something that is new to them, but it has been created by other people already. S-Creativity: Situated creativity is when the idea is new in a particular situation or context. The idea may have been used elsewhere but not in this situation. H-Creativity: Historical creativity is when the idea is completely novel and never been thought of before. Here’s an example of each. If a young person compared their lover to a summers day it could be an entirely new concept to them but it would be something that many people had heard before. Applying design thinking (the approaches used to design new products) to redesign social services is applying an existing idea in a new situation. When people first created the airplane, antibiotics or the internet they were creating things that had never existed before and were completely novel. Personal creativity is important. Personal creative activities lead to psychological wellbeing and they can be the precursors of bigger, more significant creative insights. I’ve found these concepts useful when thinking about creativity and I hope they’ve made creativity less mysterious for you too. A great, quick read on creativity theory is ‘Creativity in a Nutshell’ by Margaret Boden. One of the most extensive studies of creativity and creative individuals (including nobel prize winning scientists, social activists and futurologists) is the book ‘Creativity : Flow and the Psychology of Discovery and Invention’ by Mihaly Csikszentmihalyi. This entry was posted in Creativity and tagged creativity, elaboration, evaluation, idea, illumination, immersion, incubation, innovation, margaret boden, surprise. Bookmark the permalink.